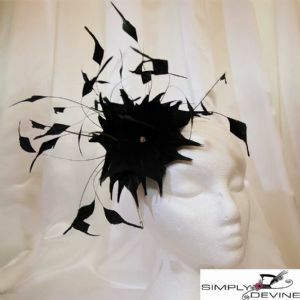 This is an amazing dramatic piece of millinery for those ladies not wanting to go down the formal route. The abundance of feathers add drama and movement to this amazing fascinator set on a very find headband (you won't even know you are wearing this piece! ), and if you have a very fine head of hair, its perfect as you can hide the very fine headband. Liz Devine-Wright's award winning hat shop nestled in the Samuel Smith's brewery town of Tadcaster, and to where ladies travel the length and breadth of the UK to visit and ladies 'pop' in from Dubai, is a gem of a hat shop where you will get honest expert Yorkshire advice. Not only do ladies travel all over the globe to the Simply Devine Hat Shop, we have pop idols as customers too! Liz Devine-Wright has been sending hats, hatinators, fascinators and pashminas, not to mention co-ordinating handbags for weddings and race day events for nearly 12 years. Buy British headwear, buy Simply Devine!